Royal Caribbean International launched the Freedom of the Seas in May 2006. The cruise line distributed these debut photos of the new ship, which were taken on the Freedom of the Seas inaugural voyage and during early sea trials. 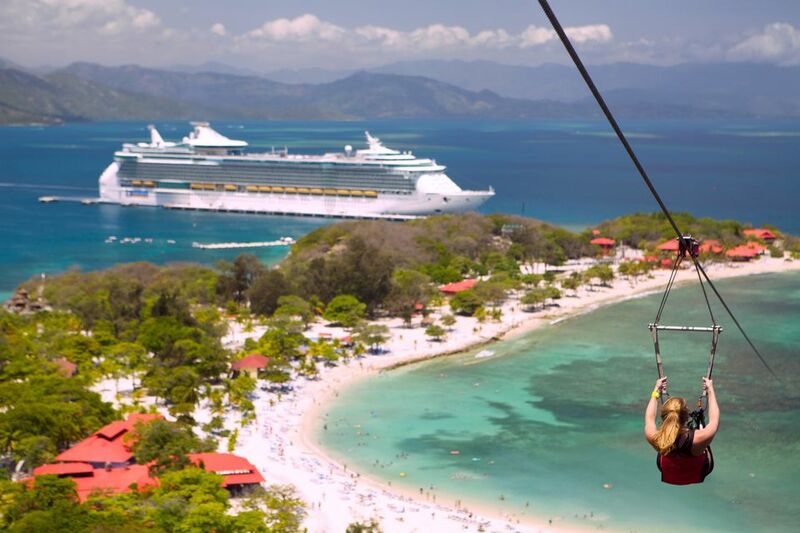 The Freedom of the Seas has many exciting, innovative features that amaze and entertain its 3,600 passengers. Continue to 2 of 49 below. Freedom of the Seas was the first ship in the Freedom class for Royal Caribbean. Liberty of the Seas (launched in 2008) and Independence of the Seas (launched in 2008) are in the same class. Continue to 3 of 49 below. Tug boats are not really small, but this one sure looks that way next to the Freedom of the Seas. Continue to 4 of 49 below. The Freedom of the Seas cruise ship features large, cantilevered hot tubs that stretch out over the ocean below. Continue to 5 of 49 below. On warm, sunny day, the hot tub and pool bar are busy places on the Freedom of the Seas. Continue to 6 of 49 below. Passengers on the Freedom of the Seas can surf or ride a boogey board in the FlowRider surfing pool. Continue to 7 of 49 below. The H2O Zone is a fun place for kids to play in the water. Continue to 8 of 49 below. The H2O Zone is a kid's water park that looks like it would be as much fun at night as it is in the daytime. Continue to 9 of 49 below. Most travelers might not see boxing as a relaxing cruise activity, it is a good way to work off some of the stresses of your job back home. Continue to 10 of 49 below. Many cruise travelers love to have a spa treatment to relax and rejuvenate. Continue to 11 of 49 below. Spinning on one of these cycles in the Freedom of the Seas fitness center will help you burn off some of those added calories you are consuming! Continue to 12 of 49 below. Rock climbing walls are a popular activity on many cruise ships. Continue to 13 of 49 below. Doesn't the bedding in this cabin look inviting? Continue to 14 of 49 below. You can feel like a Presidential family if you book this suite. Continue to 15 of 49 below. Continue to 16 of 49 below. The main dining room on the Freedom of the Seas is elegant and beautiful. Continue to 17 of 49 below. Sorrento's is a popular place for pizza on all of Royal Caribbean's cruise ships. Continue to 18 of 49 below. The entertainers on the Freedom of the Seas cruise ship put on amazing shows in this theater. Continue to 19 of 49 below. Continue to 20 of 49 below. Continue to 21 of 49 below. Continue to 22 of 49 below. Continue to 23 of 49 below. Continue to 24 of 49 below. Continue to 25 of 49 below. Continue to 26 of 49 below. Continue to 27 of 49 below. Continue to 28 of 49 below. Continue to 29 of 49 below. Continue to 30 of 49 below. Continue to 31 of 49 below. Continue to 32 of 49 below. Continue to 33 of 49 below. Continue to 34 of 49 below. Continue to 35 of 49 below. Portofino Restaurant has some amazing Italian food on the Freedom of the Seas. Continue to 36 of 49 below. Continue to 37 of 49 below. This photo is probably the only one you'll ever see of the Windjammer Cafe without any people! Continue to 38 of 49 below. Continue to 39 of 49 below. Continue to 40 of 49 below. Continue to 41 of 49 below. Continue to 42 of 49 below. Continue to 43 of 49 below. Continue to 44 of 49 below. Continue to 45 of 49 below. Continue to 46 of 49 below. Continue to 47 of 49 below. Continue to 48 of 49 below. Continue to 49 of 49 below.